John Williams' busy 2005 comes to a close with the second of his two scores for Spielberg, who also seems to be on something of a roll, masterfully alternating his popcorn entertainments - War of the Words - with his rather more adult work in the shape of Munich. The film follows the aftermath of the shocking events at the 1972 Olympics in which eleven Israeli athletes were taken hostage by Palestinian terrorists, claiming the lives of all the athletes and most of the terrorists. Naturally, this is a subject requiring some considerable strength of character on Spielberg's part, together with measured sensitivity. Unsurprisingly, both sides have made some complaint, but the fictionalised account has, for the most part, received much praise. In its broadest terms, Munich is a political thriller, but goes beyond what such an appellation implies, especially in regard to the lead character Avner, played by Eric Bana, and his torn morality at carrying out unofficial state sanctioned assassinations. The tragedy of that one day in Munich and Avner's soul are very much at the forefront of Williams' score. Of these, A Prayer for Peace is perhaps the most compelling, one of the composer's most elegant adagios which recalls Born on the Fourth of July and Georges Delerue's Platoon, but with even more delicacy than either. Stripped back, in a remarkably effective arrangement for guitar solo performed by Adam del Monte, it becomes Avner's Theme where the intimacy and appreciable lack of melodrama are extremely fetching. The arrangement for guitar and solo cello counterpoint in Bonding is equally moving. Despite its current status as most overworked film music cliché, Lisbeth Scott's mournful ethnic vocals during the opening track and Remembering Munich are effectively employed and entirely suitable. Williams has commented that his use of Jewish and Palestinian stylistic traits are more evocative than authentic, but, as he did with Memoirs of a Geisha, he works both into his native style with typical skill. The ethnicity is clear, but so too is the composer's own inimitable musical voice. The 70's setting allows a little retroactive composition style, echoing his scoring of the period, especially the rather Goldsmithian Black Sunday, notably the rumbling pianos of The Attack of Olympic Village being especially effective, so too is the striking bass melody of the otherwise slightly non-descript Stalking Carl. Despite its obviously downbeat mood, Munich is certainly not lacking for beautiful melody, although rather monothematic. Those tracks that don't feature some variation of Avner's theme - particularly some of the thriller/suspense elements - are occasionally a little forgettable and before the sombre end credits, the album loses a little direction in its latter stages. The occasional use of a very deep synthetic percussion is unsettling, subliminally heightening the urgency of a scene, but rather hard to take on their own terms. 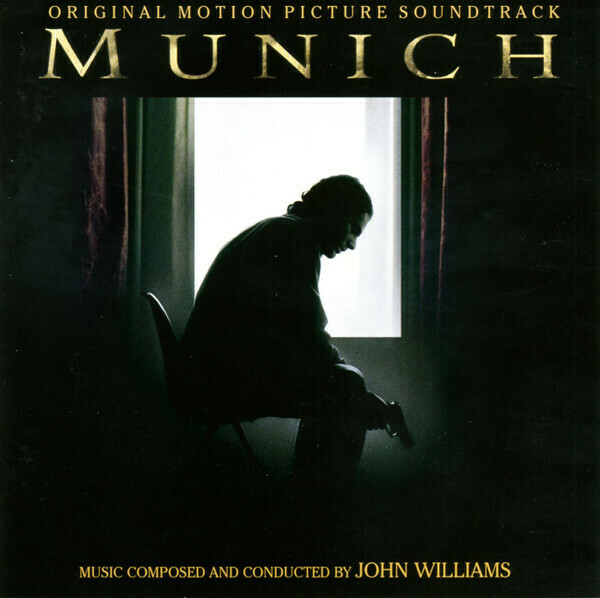 It seems that tragedy - whether of sci-fi soap opera, apocalyptic, personal or political proportions - hasn't been far from Williams' scoring this year and Munich does end on an exceptionally sobering note. Despite a handful of tracks with the composer's obviously melodic touch, many fans are going to find this tough going, even more so than the abrasive War of the Worlds, but equally worth exploring for its inwardly haunting humanity.